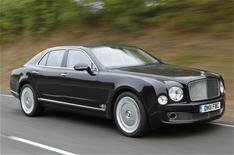 Bentley Mulsanne review | What Car? What is it? The Mulsanne is Bentley's flagship model, and one of the most extravagant luxury saloons money can buy. What's it like to drive? Whether you drive it yourself, or you employ somebody else to do that, you want a limousine to waft you along in supreme comfort. Luckily, that's exactly what the Mulsanne does. In its Comfort setting, the suspension soaks up any bump or pothole that the battered UK road network can throw at it, leaving the Mulsanne's occupants blissfully unaware of the craggy surface beneath. The suspension's Sport setting firms things up a little, but even then, the ride is still impressively smooth. You don't need the Sport setting to make the Mulsanne handle smartly, because it does so in all four driving modes. True, it's an enormous car, and you never forget that, especially when negotiating tight city streets or narrow country lanes. However, the body always stays well controlled, there's a huge amount of grip and the steering is reassuringly weighty. The Mulsanne's huge bulk doesn't hinder its performance, either, thanks to the 6.75-litre V8 under the bonnet. It serves up 506bhp and can haul this enormous lump of metal from 0-62mph in a staggering 5.1 seconds. However, you rarely find yourself hammering the throttle in this way. It's much more satisfying to use the engine's enormous low-end torque to build your speed briskly and smoothly, with no drama whatsoever. Adopt this relaxed driving style, and you'll enjoy the Mulsanne at its luxurious best. The smoothness of the eight-speed automatic gearbox also helps keep things feeling first-class, as does the car's incredible suppression of wind- and road noise. Whatever your speed, you barely hear a peep from the outside world. What's it like inside? Who cares what the Mulsanne is like to drive, though, because most owners won't be doing the driving themselves they'll be living it up in the back. Life is good back there, too. There's as much space as the car's gargantuan proportions promise headroom is generous all round, and there's so much rear legroom that your knees won't even come close to touching the seat in front. The rear seats also move electrically to help their occupants find the most comfortable position possible for their journey, plus the chairs will give you a massage along the way. You even have control of the infotainment system via your own remote control. The cabin has a real feeling of luxury and craftsmanship, too. Wherever you look, you'll see leather, wood and chrome, and every surface feels dense, tactile and beautifully finished. The operating system for most of the car's functions is recognisable from high-end Audis, but that's no bad thing because it's just as easy to use. The switchgear has been restyled to belong in a Bentley, so you don't feel like you're being short-changed. The one area where the Mulsanne disappoints is the boot. It's much smaller than you'd expect at just 443 litres (similar to your average small family hatchback), and there's a large lip that you will have to lug your bags over. Should I buy one? The 'basic' car will set you back almost 225,000, and that'll be just the start for most buyers. There are countless luxury options upon which to spend even more cash, including a TV tuner, multiple parking cameras and any number of paint, leather and carpet upgrades. The Mulsanne's running costs will be just as off-the-planet as the purchase price. The car averages just 16.8mpg, and CO2 emissions are similarly scary. The amount you'll lose in depreciation alone over three years would be enough to bankrupt most of us. Still, this isn't a car for most of us it's a car for the seriously wealthy; for people who simply won't care how much it costs to buy and run. If you're lucky enough to be in that position, the Mulsanne is a pleasant way to get around. It easily has enough space and quality to match the similarly priced Rolls-Royce Ghost, and has a smoother ride and better refinement. The thing is, the Mercedes S-Class performs the luxury limousine role better than the Mulsanne, and for a fraction of the cost. That's where our money would go.